This is the first ambient digital-only album released on LuminaSounds and will be available on iTunes, Amazon and the like through CD Baby in the near future, more details to follow. 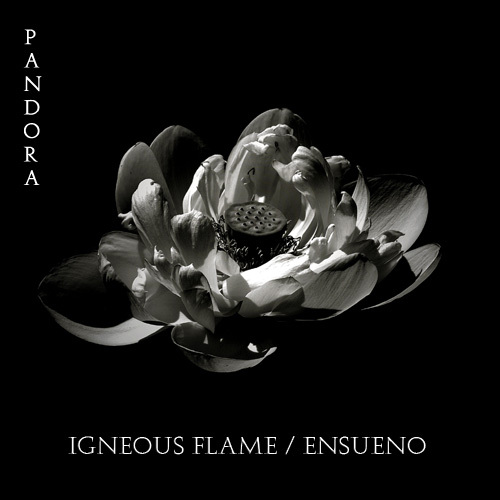 'Pandora' is the album that arose out of the collaboration between Igneous Flame (UK) and Ensueno (Russia). In 2011, Rudy (Ensueno) got in touch with me asking about the possibility of us releasing a collaborative album. From what I'd heard of Rudy's work, I was always impressed with what he had created, so I was happy to agree to this. He sent me a considerable amount of music, which I listened to intensively, chose the work I preferred and then proceeded to work with this material. The source material for the album was entirely Rudy's and my involvement was primarily reworking and production. I added certain sound elements, manipulations and (spatial) processing in particular. Rudy's original material was extended and 're-composed' extensively. This collaborative process took seven months and resulted in our album 'Pandora'. The Internet facilitated the work, from Rudy initially sending me his full resolution source material from his studio in Russia to my studio in England via download links, to the final stage of releasing the album on CD Baby to be digitally distributed to the major download sites. Pete Kelly (Igneous Flame), August 2012. Produced and Mastered by Igneous Flame at Nimbus Studios, England. Artwork Image by Kati Astraeir. LuminaSounds Label release, catalogue number: LS-07. Beautiful Pete....downloading the Flac version from Bandcamp now. Also powerful photo/artwork. Looking forward to exploring the the release in glorious 24bit res. Hope you enjoy it Julio ! Thanks for the comments 'h' too. one of the best of 2012! Wow does that sound amazing or what? sounds good! I need to download this, too. Pandora, from Igneous Flame and Ensueno, is a different kind of collaboration. Ensueno, a Russian ambient artist, created a series of tracks which he then handed over, digitally speaking, to Igneous Flame (aka Pete Kelly). Kelly took a select set of the sounds and then “added certain sound elements, manipulations and (spatial) processing in particular,” and “re-composed extensively.” The outcome is a lush common ground filled with huge, warm synth pads and misty, deep-dream atmospheres. Each of the pieces here moves through certain changes, most in the form of a rising low end, just on the benign side of marginally menacing, that nudges its way through the flow before being swallowed into it, so there is some textural change in what’s otherwise a breath-slowing mass of classic ambient. Kelly’s always been good for that, though; his cloudy sound-shapes offer up touching chord changes for a distinct emotional content. It’s easy to get fully lost in these eight tracks only to become aware, somewhere mid-stream, that you are responding to it viscerally. The music here can be quite moving in those places where it rises in your awareness–but Kelly and Ensueno seem intent on keeping you deeply immersed and offering no reason for you to come out until they’re done. After four tracks of this, though, the duo make the excellent decision, on “Lightstorm,” to break the drift with some rich percussion. It’s brief but effective, an unexpected shot of adrenalin before they let you drift back into the enveloping flow. "...a disc to put on and just leave running." Kind of hard to do when it's not a disc. I would imagine is was just a turn of phrase - hardly the most salient part of the review, methinks.